There’s nothing quite like the aroma of Indian street cuisine, the heady mix of spices tantalising the senses and triggering the appetite. 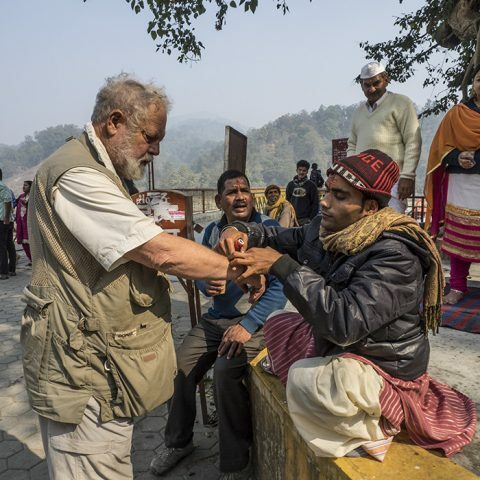 But like many other travellers to India, I’m often hesitant about eating street food, with fears of the notorious ‘Delhi Belly’ tempering my gastronomic adventures. 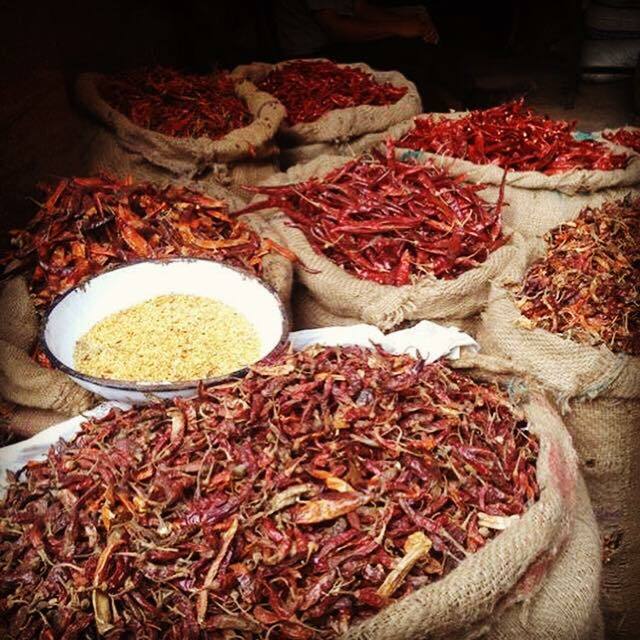 The solution to this is local knowledge; and when it comes to food, there’s no one more informed than our guide on Mantra Wild Adventure’s Food and Heritage walking tour of Old Delhi. Not only is Ramit a passionate historian, but he’s also the ultimate foodie – enthusiastic and perpetually hungry. Over the course of several hours, he’ll lead us to his favourite street stalls in Chandni Chowk, with the aim of proving to us that food purchased in this ancient marketplace is not only safe to eat, but also innovative and delicious. 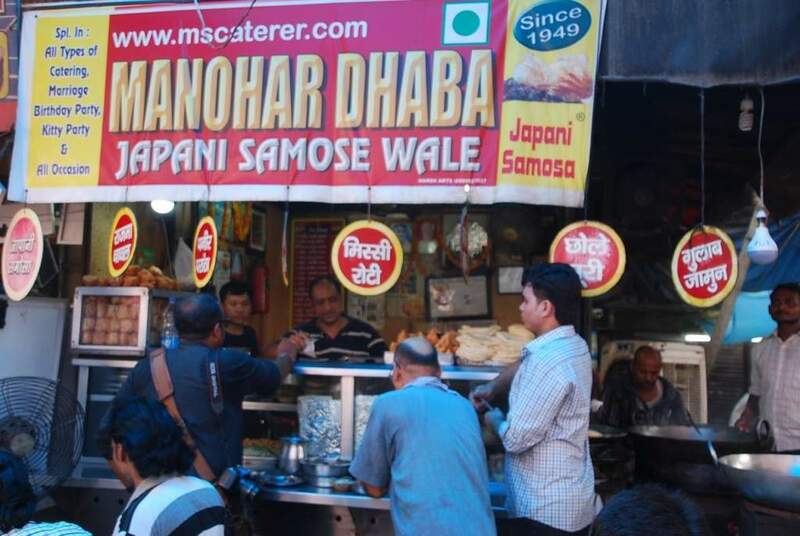 First stop on our walking tour is a stall called Manohar Dhaba, which has been selling the curiously named Japanese Samosas since 1949. Unique to this vendor and made from a secret recipe, these samosas are created from 60 layers of pastry, an explosion of spiced peas and potatoes in a crunchy casing that costs just 8 rupees (around 15c) each. Many of the stalls in Old Delhi date back to the 1800s, handed down from generation to generation. The famous Paranthe Wali Gali (Paranthe Alley), for instance, was originally known for its silverware shops, before a string of paranthe walas moved in during the 1870s. During its peak in the 1960s, there were 20 restaurants in this tiny laneway selling versions of the fried North Indian bread – only three remain, each one crammed with diners eagerly devouring the crispy flatbread, prepared in a street-front wok and served with dipping curries and condiments. Sweet treats are also high on every Indian’s agenda, with one of the most popular a sticky curl of fried dough called jalebi. 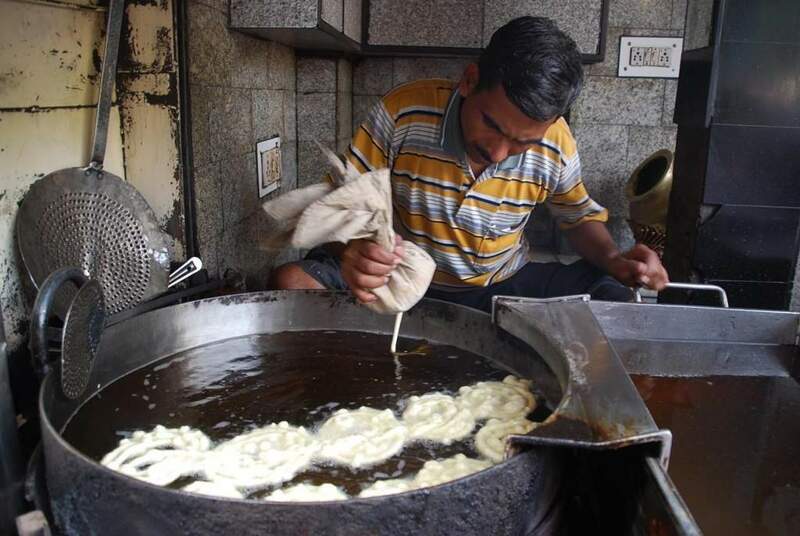 The oldest and most famous jalebi wala, dating back to 1884, is called – surprise, surprise – The Old and Famous Jalebi Wala, with the sticky pretzels whipped up before your eyes in what amounts to an amazing display of culinary street theatre. As the midday heat bears down on us, Ramit hails a bicycle rickshaw to hasten our progress through the increasingly chaotic Chandni Chowk. 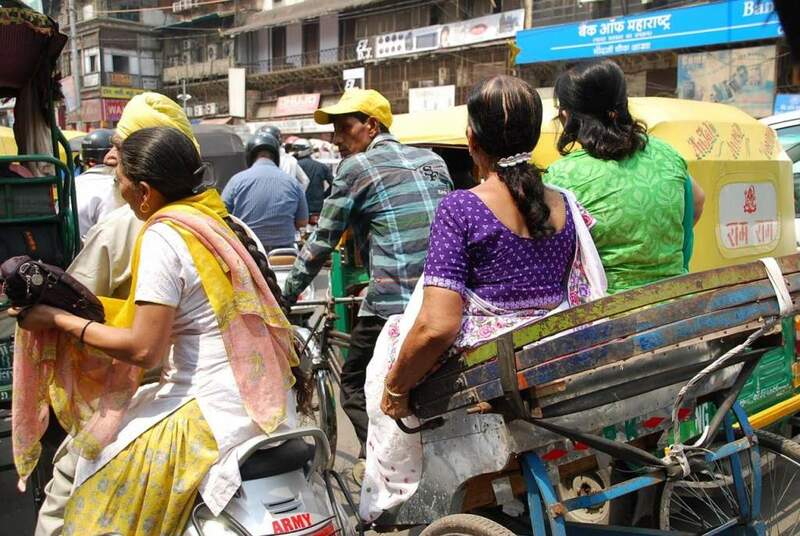 Instead, we find ourselves trapped in a claustrophobic traffic jam, cheek to jowl with dozens of other bicycles as well as bullock-drawn carts, honking taxis and garland-decorated trucks using their size as leverage. It’s hilarious, but also rather terrifying – and we alight 20 minutes later outside the Old Delhi Spice Market, grateful for our lives and ready to continue our walking tour. 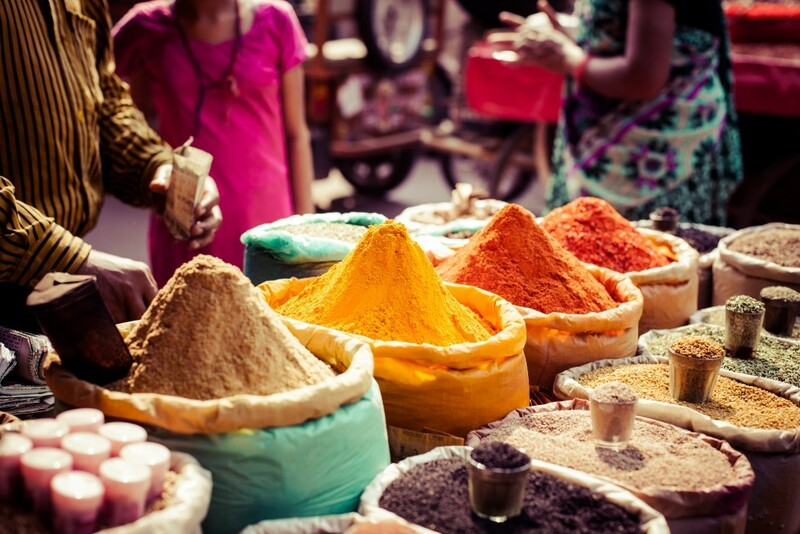 The spice market – the oldest in Asia – is both a visual and olfactory delight, pungent with the aromas of ground turmeric, cumin, nutmeg and nuts. There’s even a section dedicated to chilli, bags of fiery red peppers stacked to the rafters setting me off in a fit of sneezing. But Ramit isn’t done with feeding us just yet. Despite our protestations that we are fit to explode, he promises one last snack that we won’t be able to resist – a dessert called Mango Kulfi. 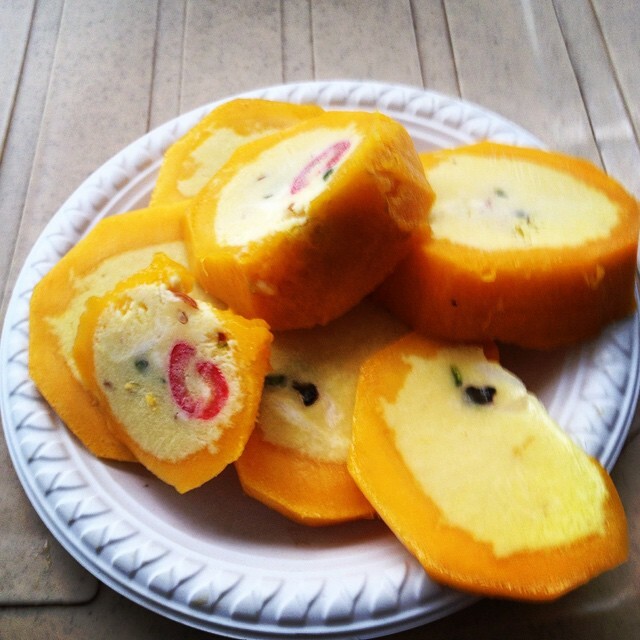 Stepping into an unmarked, near-empty concrete space in a nondescript back alley, we are presented with slices of frozen mango, stuffed with a creamy filling thickened with rice flour. 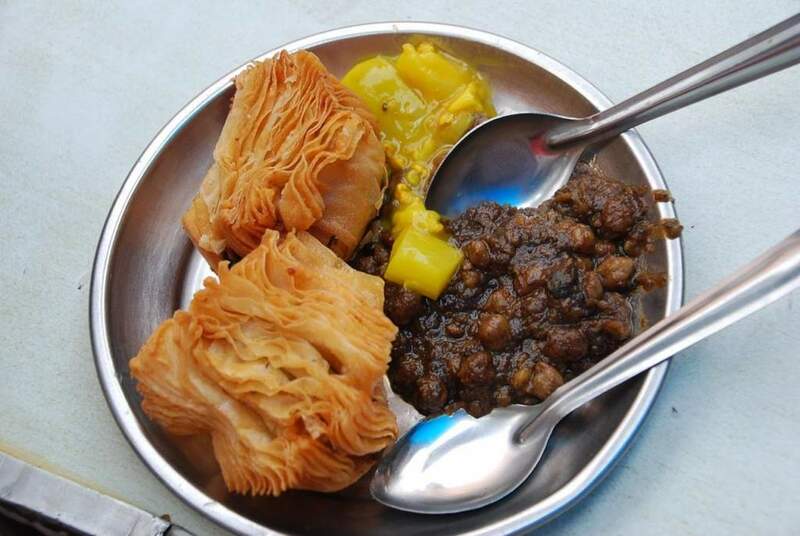 It’s a veritable taste sensation, sweet and cooling and the perfect epilogue to our eye-opening, mouth-watering and belly-expanding Indian food tour. 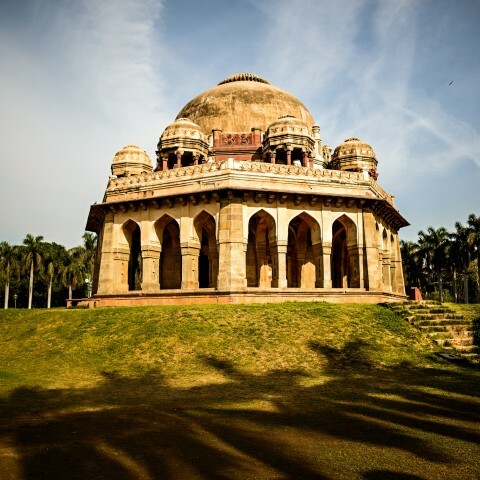 Our Old Delhi Heritage and Food Walking Tour is AUD$150 per person in conjunction with a Mantra Wild Holiday package. Have you been to Old Delhi? Tell us about your experiences in the comments. 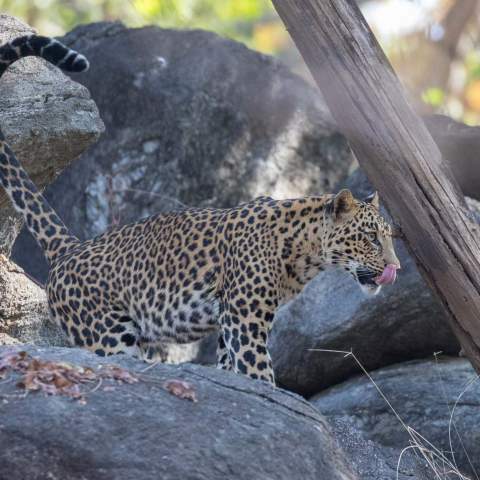 Reena, both your descriptions and photos are mouth watering! Like your perfect walking tour Foodie guide, Ramit, you are the perfect travel blog guide. I have never been to India. I absolutely would book my tour with you and your company. Your passion for India and New Delhi is visceral. Fantastic post. Reena, my mouth is watering reading this post! Everything sounds delicious!! What a wonderful excursion to add to a package! Thank you for sharing the experience so vividly in this post! !